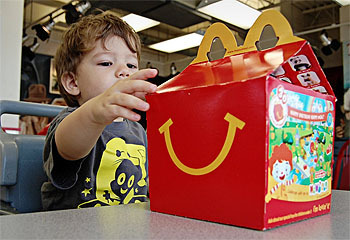 San Francisco’s board of supervisors has voted, by a veto-proof margin, to ban most of McDonald’s Happy Meals as they are now served in the restaurants. The measure will make San Francisco the first major city in the country to forbid restaurants from offering a free toy with meals that contain more than set levels of calories, sugar and fat. world series on Monday night. “One day you’re world champions, and the next day, no toys for you,” Conway said. That’s mighty sad. But here’s what I’m curious about: does McDonald’s or the California Restaurant Assn. have any kind of constitutional case to make against this statute based on the commerce clause? The obvious answer is no: the commerce clause merely gives the federal government the right to regulate commercial activity if it wants to. If it doesn’t, there’s nothing stopping states or local governments from passing any regulation they want. And they do. Every state has different insurance regulations, different environmental regulations, different health and safety regulations, etc. And yet….something here bothers me. Leave aside the substantive question of whether San Francisco’s decision was a righteous blow for our children’s future or the first step down the slippery slope of fascism. McDonald’s, like every big company, sells standardized merchandise nationwide. This is impractical if every city in America decides to have its own rules. No toys in San Francisco. No trans fats in New York City. No styrofoam containers in Houston. No factory farmed beef in Seattle. No California potatoes in Boise. No artificial sweeteners in Boston. Etc. I dunno. Does this make sense? What’s the proper dividing line between states and cities being allowed to set their own rules as they see fit, and nationwide companies being allowed to effectively sell their products nationwide? I haven’t really thought this through, but I imagine plenty of others have. What’s the state-of-the-art thinking on this?